MEET "GRACIE" SHE'S A 495 HP MANUAL TRANS FRAME-OFF GOOLSBY CUSTOMS RESTO-MOD WITH MORE ACCOLADES THAN YOU CAN IMAGINE!!!! 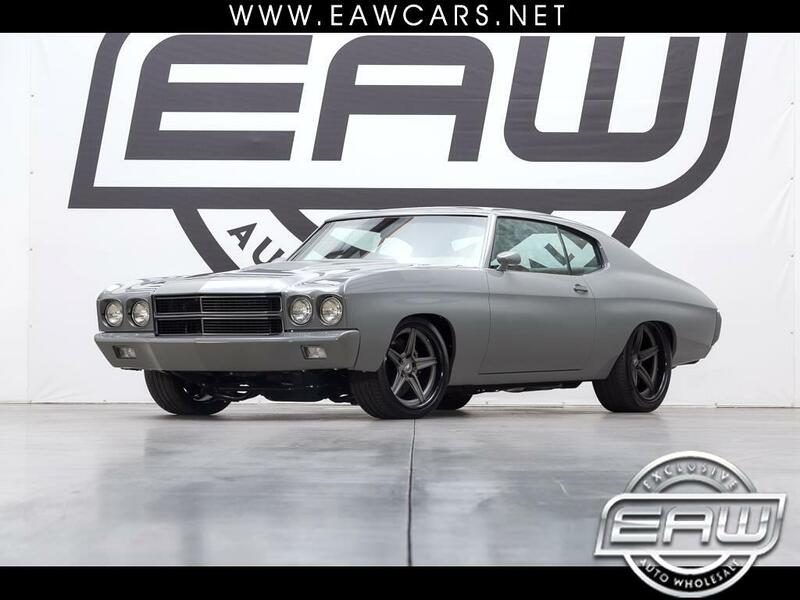 http://www.superchevy.com/features/1710-goolsby-customs-delivers-with-a-standout-1970-chevrolet-chevelle/ A LINK TO SUPER CHEVY MAGAZINES' DETAILED STORY OF THIS EXACT CHEVELLE FROM THE DAY THE PROJECT BEGAN... HOT CAM .525 INCH LIFT ON INTAKE AND EXHAUST SIDES, 219 DEGREE/228-DEGREE DURATION SPECS, TREMEC T-56 MAGNUM MANUAL TRANS CUSTOMIZED AND DIALED IN BY BOWLING PERFORMANCE TRANSMISSIONS TO GIVE THE 6 SPEED THE EXTRA EDGE TO SHIFT SMOOTHER AND PERFORM BETTER UNDER HIGH TORQUE AND RPM, INLAND EMPIRE DRIVELINE CUSTOM DRIVESHAFT, CURRIE ENTERPRISES FORD 9 INCH WITH LIMITED SLIP AND 3.73 GEARS, GOOLSBY CUSTOM EXHAUST WITH BORLA PROXS MUFFLERS, 14'' WILWOOD BRAKES, RIDETECH HQ COIL OVERS, SPEEDTECH TRACK TIME PACKAGE, B FORGED 500 TS WHEELS, PIRELLIS, 20'', NO KEYS HOLES, PERFECT BODY LINES, LOKAR GOOLSBY EDITION DOOR HANDLES, BILLET SPECIALTIES STEERING WHEEL, BOWLER SHIFT KNOB, 3 LOKAR PEDALS, COMPLETE AC WITH BRAND NEW VINTAGE AIR UNIT, THIS CUSTOM CHEVELLE WAS MEANT TO BE DRIVEN AND DESIGNED WITH THE IDEA OF COMBINING A HIGH PERFORMANCE AMERICAN MUSCLE CAR WITH THE IMAGE OF A HIGH END EUROPEAN EXOTIC... THE PRODUCT IS ONE OF A KIND!!! THIS CUSTOM BUILD HAS 6K MILES AND DRIVES LIKE AN ABSOLUTE DREAM!!!! IT HAS STACKS ON STACKS OF INVOICES FROM GOOLSBY RUNNING FAR OVER 200K.. THIS IS THE REAL DEAL FOLKS THERE'S NO DOUBT ABOUT IT. IT WON BUILDERS CHOISE AWARD AT THE GOODGUYS EVENT IN COLUMBUS OHIO AND 2016 AND HAS BEEN FEATURED IN MORE MAGAZINES AND INTERNET ARTICLES THAN I COULD POSSIBLY LIST!!! CUSTOM BUILT IN HUEYTOWN ALABAMA BY GOOLSBY CUSTOMS, "GRACIE" TOOK OVER 2,300 HOURS OF LABOR TO COMPLETE .... THE CUSTOM PAINT IS GLASURIT NARDO GRAY AND HAS A TAN FERRARI DAYTONA LEATHER STYLE INTERIOR, SHE PUSHES 473 LB.-FT. TORQUE AND WILL QUICKLY STUN ANY DRIVER, RIDER, OR VIEWER. THE PRICE HAS BEEN REDUCED $50,000 FROM THE ORIGINAL LISTING PRICE. FOR AN ACTUAL SEMA BUILD CAR THIS CAR IS WORTH THE MONEY!!!! Message: Thought you might be interested in this 1970 Chevrolet Chevelle.